At least one current home and/or consumer loan (such as a personal credit card or non-commercial vehicle loan) reflecting current credit data reporting through FICO® sufficient to generate a FICO® Score*. A valid RCU online banking login registered to your own social security number as associated with the above loan(s). A valid FICO® Score greater than zero (0) reporting within the most recent calendar quarter. Contain at least one undisputed account older than six months. Contain at least one undisputed account updated within the past six months. Not contain a deceased indicator on the credit report. If an individual’s FICO® Score is not greater than zero (0), they will not be able to view the FICO® Score through RCU’s online banking or the mobile app. Individuals who are new to credit, or in some cases, individuals who have decided to re-establish credit after not having an active FICO® Score for some years, may not be able to see a score due to not having a score greater than 0. Member’s loan activity with RCU is limited to business, Trust, estate or other ineligible loan types. Consumer and/or home loan reporting to FICO® is in an ineligible delinquent status. Remember, if you use your RCU credit card for purchases or transfers and pay it in full before the end of a credit reporting cycle, you may not be impacting your credit score at all since all activity has taken place prior to FICO® receiving the activity or history following a reporting cycle. This practice is particularly important to avoid for those new to credit who are working to establish and/or increase their FICO® Score. If you are new to credit, it may take several months before you receive a visible FICO® Score, as your oldest account becomes at least six months old. 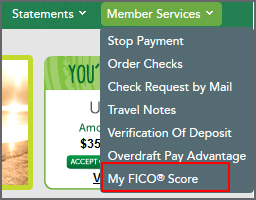 If you haven’t had active credit for some years, your score is unable to be generated for FICO® credit scoring display until you have recent undisputed activity, usually after 6 months of activity. 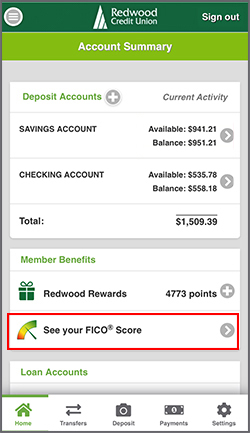 Note that RCU online banking and mobile app is displaying FICO® Scores based on FICO® Score reporting data which is updated quarterly. If you believe you meet the above criteria but are still unable to view your FICO® Score in online banking or the mobile app, please contact us. To view your FICO® Score you will need to login to online banking. You have a few options to view your score listed below. 1. 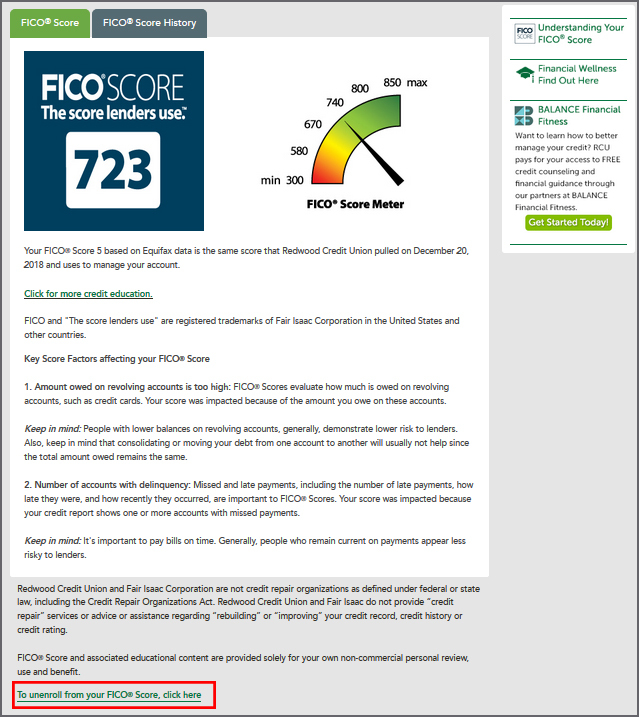 You can see your FICO® Score by clicking the link and image in the sidebar. 2. Go to the Loans section of the navigation menu. Click on My FICO® Score. 3. Go to the Member Services section of the navigation menu. Click on My FICO® Score. To view your FICO® Score you will need to login to your RCU mobile app. RCU mobile banking is available as a downloaded app or through your device's browser. You have a few options to view your score listed below. 1. 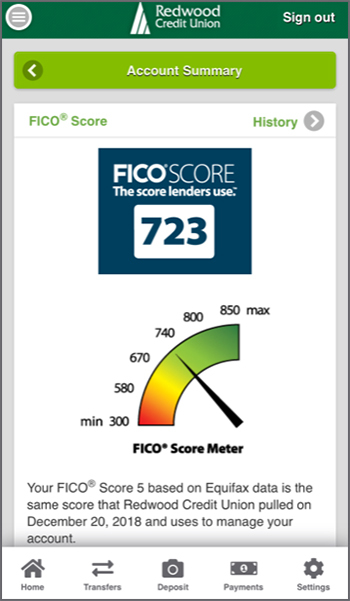 You can see your FICO® Score by clicking the link on the Account Summary page. 2. Or go to the Account Info section of the navigation menu. Click on FICO® Score.